Working from 5:30 am to 4:30 pm every day is catching up with me. I have a stack of things to sell on eBay, kids to play with/raise, a house to take care of, a never ending job, and sometimes in there I get to be a husband. So, posting has been moved to the back burner. Heck, it's not even on the stove right now. Moving on to my backlog of ready made cards, next up is Al Kaline. Mr. Tiger was waning as early as the 1972 season, but that didn't stop Topps from issuing a 73 and 74 card. 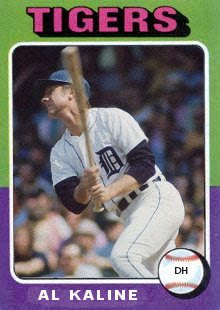 However, in the 1974 campaign, Kaline had a monster season for being at the end of his career, which for some reason Topps only saw fit to issue a 75 Topps Highlight. He played in the most games (147) since his 1961 season, and passed the 3,000 hit mark. He also came up 1 dinger short of the 400 plateau. I guess the DH is good for one thing. After this season, Mr. Tiger moved up to the broadcast booth to share the mic with another HOFer, the late, great George Kell. What a tandem. Anyways, here is my rendition of his 1975 Topps card, the best set known to nerd-kind. I screwed up the paint where the name is...too much eraser. George and Al were a phenominal broadcast team. I am more attached to their memories than to Ernie Harwell. The best part about Al's broadcasting is that he only made points that needed to be made and he NEVER talked about how great he was. If you hadn't heard the intros before the game you'd think it was some utillity infielder doing color. There was talk of whether he would come back in '75 for that 400th HR, to become the AL's first 3000/400 man, but he did not want to play at a level beneath him just to chase a number...and he lost 3 hrs during his career to rainouts. For my money, Yaz's "first 400/3000" designation is as asterisk worthy as any steroid record.